Archpriest Stephen Charles Mack. 64, long-time Rector of Saint Nicholas Church, Auburn, NY, fell asleep in the Lord peacefully, surrounded by his loving family, at Matthew House on Sunday, October 22, 2017. Born in Cohoes, NY on September 10, 1953, the son of Stephen and the late Helen Gydamashuk Mack, he was a 1971 graduate of Keveny Memorial Academy and a 1976 graduate of Saint Tikhon’s Seminary, South Canaan, PA. 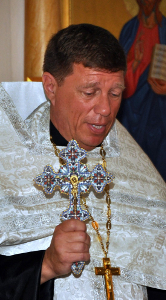 He married the former Barbara Nystoriak in 1978 and was ordained to the diaconate on November 23, 1980. After his ordination to the priesthood on July 8, 1984, he was assigned Rector of St. Nicholas Church on December 20, 1984, serving the parish until his repose. In addition to his pastoral ministry, Father Stephen was Spiritual Advisor of the District Senior and Junior Fellowship of Orthodox Christians in America and served on the Board of the Auburn Human Rights Commission and Cayuga County Homesite. He loved spending time with his family and traveling, and he was an avid Yankee fan. In addition to Matushka Barbara, he is survived by two cherished children, Christopher David Mack of Auburn, NY and Tanya Nicole Mack of Wilmington, NC, and his beloved granddaughter Loralie Rose Mack. He is also survived by his father, Stephen Mack of Scotia, NY, and several nieces, nephews, great nieces and great nephews. In addition to his mother, he was predeceased by his sister, Barbara Anne Mack Rimanosky, in 2000. Visitation will begin at Saint Nicholas Church at 3:00 p.m. on Friday, October 27. The Rite of Burial for a Priest will be celebrated at 6:00 p.m. The Divine Liturgy and Panikhida will be celebrated at the church at 9:30 a.m. on Saturday, October 28, followed by interment in Saint Nicholas Cemetery, Aurelius, NY. Donations may be made in Father Stephen’s memory to Saint Nicholas Church, 81 Cottage St., Auburn, NY 13021; Hospice of the Finger Lakes, 1130 Corporate Drive, Auburn, NY 13021; or Matthew House, 43 Metcalf Drive, Auburn, NY 13021. May Father Stephen’s memory be eternal!